Within the chic and contemporary ambiance of The Cove Atlantis, the Indigo Suite offers vacationing couples a unique luxury resort experience in paradise. Located on floors 8 through 15, at 924 sq. ft. these suites boast larger floor plans for added space and comfort during your vacation. Relax and unwind with a variety of views from your full and French balconies. 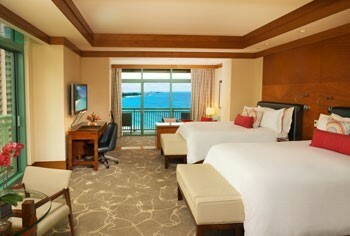 Every suite offers a tranquil ocean view and extended views of either Nassau Harbor or Atlantis’ waterscape. No Reviews For INDIGO SUITES Yet! Why not get the conversation started and write a review today! Want your next stay with Atlantis at Paradise Island Resort and Casino comped?